This is one of my mother's favorite candies! Butter a 9 x 13 baking dish. Combine the first 6 ingredients in a heavy saucepan: cook over medium heat until the sugars dissolve, then continue cooking until the mixture begins to boil, stirring constantly. Boil until a candy thermometer reaches the the soft-ball stage (234 ~ 243 degrees). Remove from heat, stir in the white chips until they are all melted and mixture is smooth. Add the remaining ingredients, mix well. Pour into prepared pan, and cool to room temperature. Cut into squares, store refrigerated in an air tight container. Makes approx. 60 pieces. Note: The total boiling time is around 30 minutes. And look at this! We won over on this blog! p.s. I can't take credit for this awesome photo. Oh.my.goodness. 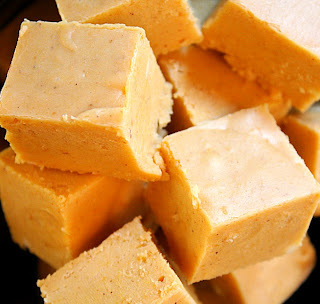 I have been looking for a pumpkin fudge recipe and can NOT wait to try this! Thank Boo! OMG this sounds amazing! Definitely a keeper--thanks for sharing! Ohhhh...my mom makes the most wodnerful fudge but she has never made a pumpkin! I hoep you don't mind that I shared it with her. She is going to try it out this weekend! I was wondering the other day if there was such a thing as pumpkin fudge, then I saw your recipe today. It looks mouthwateringly delicious. Came back to let you know that I'm featuring your post! Come grab my featured button if you'd like one! This looks like a really delicious tasting fudge. I have bookmarked it and cannot wait to give it a try. Wow! This looks amazing! I love pumpkin spice and fudge. You are brillant!! Growing up in the 90's, I never heard of pumpkin spice fudge. The oddest sweet I heard of growing up was salt water taffy! I wonder if this would work with sweet potato puree as well. The two vegetables are quite similar to me. I love this recipe, it turned out great. The only thing is that it doesn't turn out anything like the picture you have posted on here. I'm sorry to hear that your fudge didn't turn out like the photo. Use a clean knife each time you begin a new cut. Always score the fudge before actually cutting through it. I often use unflavored dental floss to cut through the candy if it isn't really thick. Try pouring the fudge into small square containers to set up. It makes cutting the "centers" of the candy easier and more smoothly. And finally, the candy is easier to cut and get smooth edges when it is chilled first (the small trick I used for the photo). Try it again, and don't be discouraged, mine doesn't always turn out beautifully either! Thank you SO MUCH for stopping back by and letting me know how your candy came out. It is a delicious recipe, isn't it? The first thing that jumped into my mind when you mentioned the texture of the fudge is it was probably overcooked a bit. When the mix reaches the soft ball stage, it's important to immediately remove it from the heat and stir in the white chocolate chips, and I don't recommend substituting the marshmallow creme for mini marshmallows. I think that may have been a big part of the final texture issues. 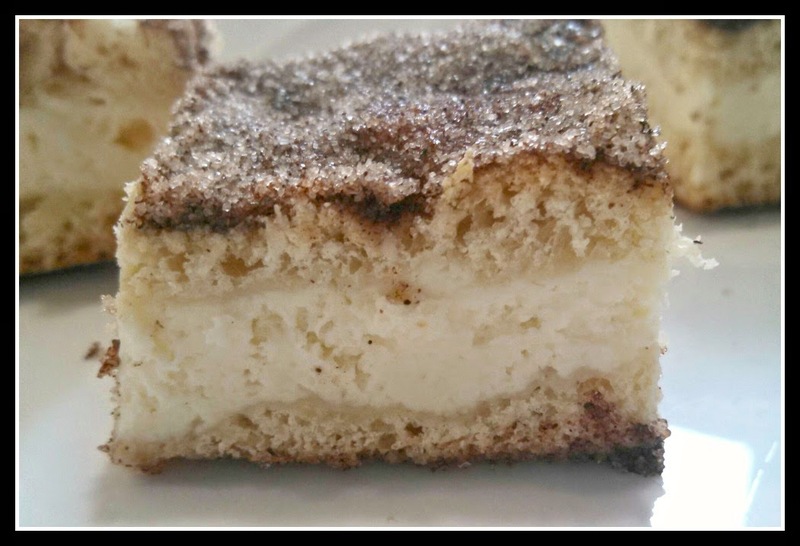 I hope you will give this recipe another try, because it really is fabulous! I wish you success with your next attempt! These were so good! My family loves them! It's so easy to make and they are so delicious! Thank you for sharing! I just finished making this and I'm so excited! It smells heavenly! I'll be linking back to you. Thanks so much for the awesome recipe! I just made a batch and couldn't resist licking the pot after pouring the mixture into the pan. Delicious! Lori, your a woman after my own heart! Thank you so much for stopping by my blog, and letting me how your candy turned out! I appreciate the time you took to do this. I know my family will enjoy it. Happy Thanksgiving to you, too! My fudge won't set! I'm due to bring this to Thanksgiving tomorrow. I can't get it to set. The top seems to get a bit hard, but the rest will not. More like syrup. :(. I tried reboiling and adding a little confectioners sugar. No help. Any ideas? I've just made two batches of this and both turned out dry and grainy. I'm pretty sure I did not over cook it. I used a candy thermometer and took it off the heat immediately. Even trying a bit in a glass of water, it was smooth and perfect. The chocolate went wonky, though, as soon as I added it. It seized and then the whole thing went downhill. Do you cool it at all before you put in the chocolate chips? You don't specify if the butter should be salted or unsalted. Can you clarify? I prefer to used salted butter with this recipe. Thanks for asking! I was'nt sure whether the the recipe called for 2 cups of white sugar and 1 brown or i cup each of white and brown. Use 2 cups white sugar, and 1 cup brown sugar, for a total of 3 cups sugar. I made this tonight and it is absolutely incredible. I will be making several more batches this holiday season. Is it possible to use Wilton white chocolate melts instead of chips? Or would altering from the traditional "chip" give me trouble? I'm still working on my confectionary skills ;) Looks delicious! Hi Soulsearcher! I'm not sure if the Wilton chocolate will work as well as the traditional baking chips. Wilton's are designed to set up solid for candy making, while traditional chips tend to stay softer once melted. If you do try the recipe with Wiltons I would love to hear how it turns out! Thanks for stopping by my blog! I decided to stick with what works and used premium white chips. Boy am I glad I didn't try to experiment!!! This fudge was absolutely OUT OF THIS WORLD!!! I gave little boxes of it as Christmas gifts; and receivers have been raving over it- asking for the recipe :) Thank you for sharing your delicious gift!! Is there anything I could use instead of evaporated milk? Violently lactose intolerant (though I can handle butter if its not mass quantities) so I can't enjoy this amazing looking recipe otherwise. I'm sure you can use rice or almond milk in this recipe, just watch the temperature cooking time a little closer because I don't know how quickly the mix will come up to the correct temp. I would love to hear what you think after trying this!